Nick Foles makes a handoff during Saturday's practice, the first he participated in after missing three straight due to neck spasms. 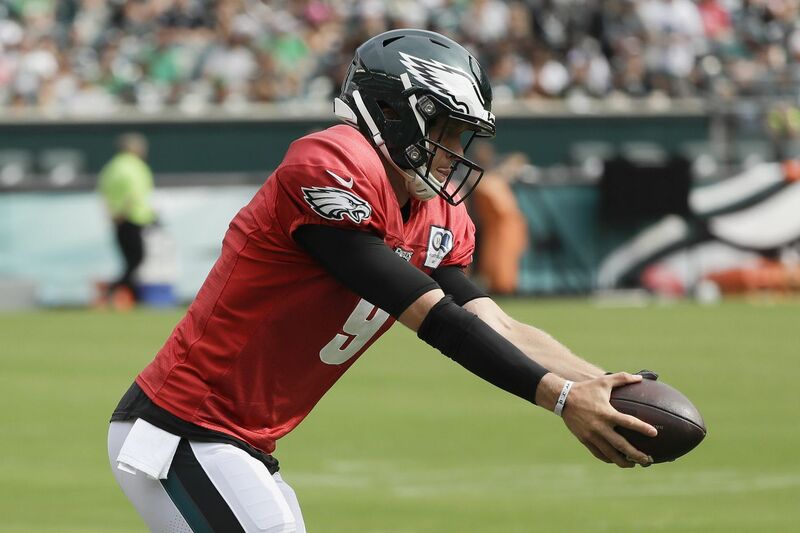 Nick Foles returned to practice on Saturday after missing three sessions and the preseason opener with muscle spasms in his neck-trap area. He insisted on Tuesday that there was nothing to be concerned about, and he had an impressive performance in front of an announced attendance of 35,000 fans at Lincoln Financial Field. The fans even serenaded Foles with chants of "M-V-P!" in his first time playing in Philadelphia since the Super Bowl. "He's been feeling better," coach Doug Pederson said. Wide receiver Mike Wallace also returned to practice after exiting last Sunday with an injury. Wallace caught a deep pass from Foles early in Saturday's session. The Eagles are still missing wide receiver Nelson Agholor, who has been out since Tuesday. They were also down running back Corey Clement, who played on Thursday. The team is not required to issue an injury report during the preseason. Cornerback Sidney Jones started practice on Saturday, although he didn't complete the session while receiving treatment for a sprained ankle suffered on Thursday. Tight end Dallas Goedert left practice early on Saturday. He went to the locker room with the medical staff and did not return. The Eagles are back on the field at the NovaCare Complex 9:15 a.m. on Sunday. More than 30,000 fans came to the Linc on Saturday. The 35,000 fans at Saturday's session brings the attendance total to more than 75,000 fans for the two public practices this summer. The first public practice was last Sunday. "It's awesome," team president Don Smolenski said. "The energy has been great in both the practices. … It speaks to how great our fans are and what the team means to them, and vice versa. Everything continues to feed off each other. It's very cool." This is the sixth year the Eagles have used this training camp format, with most practices at the team's South Philadelphia facility in front of invited guests, and a few sessions at Lincoln Financial Field. Smolenski said the team has learned to try to keep them to weekends. They can't control the weather, but they had clear skies for both practices this year. There were fans lined up at the gates before 6:30 a.m. The sessions were free to the public, but tickets were required for attendance this year and attendees were invited to make donations to the Eagles Autism Challenge. The team raised nearly $100,000 at the two practices. "The practices were an opportunity to further connect … the team with that cause, and we're trying to look at more ways to continue to make that connection so people know how important that [is] to us," Smolenski said. "The practices are free, but if the generosity is there to support autism research and advance it, it's another way for us to continue to grow that platform."